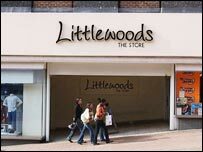 Littlewoods has sold all of its 119 shops across the UK to Associated British Foods (ABF) for £409m ($712m). ABF said it planned to keep around 40 stores to expand its Primark fashion retail business and sell the rest. The firm said it hoped to find jobs in Primark for many of the 2,500 staff working in the Littlewoods stores. Liverpool-based Littlewoods will concentrate on its catalogue and online businesses, which have annual sales of about £2bn. "Our stores business has less than a 1% market share and it could never be as dominant as our home shopping business," David Simons, chairman of Littlewoods Shop Direct Group, told the Reuters news agency. Littlewoods is owned by twin-brother entrepreneurs David and Frederick Barclay. The company opened its first outlet in Blackpool in 1937. ABF, which Twinings tea and Silver Spoon sugar, said the deal with Littlewoods was a 'unique' chance to buy a number of large stores in prime High Street locations. Primark has "a lot of gaps where it doesn't trade, and this deal allows us to fill a lot of those gaps", said ABF chief executive George Weston. "It will bring Primark to many towns and cities where it is currently not present," he explained. Mr Weston said he was confident that ABF would be able to sell the stores it does not need at a good price. Retail entrepreneur Philip Green and clothing chain New Look may be interested in buying the shops from ABF, said Seymour Pierce analyst Richard Ratner. Market reaction to the purchase was generally positive, with Numis Securities saying that it would allow ABF to expand its profitable Primark business. "In our opinion, the deal should further reduce the company's dependency on profits derived from reforming sugar activities and strengthens its fastest growing division," Numis said in a note to investors. David Liston of Barclays Stockbrokers said the deal may provide ABF with double-digit earnings growth. ABF shares jumped higher on news of the acquisition, before falling back to close 0.59% lower at 835.5 pence.